Observation - Orchid from Greek Island - Global. 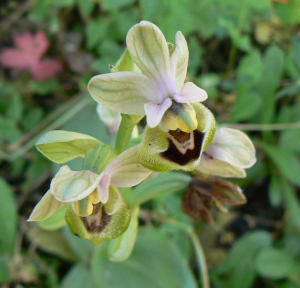 Description: Like a bee orchid, but green margin to lip. 20cm tall, 5 flowers to a spike. Single specimen. Like a bee orchid, but green margin to lip. 20cm tall, 5 flowers to a spike. Single specimen.